The Impossible Project is best known for buying up Polaroid's film factory to produce new instant film for existing Polaroid cameras. 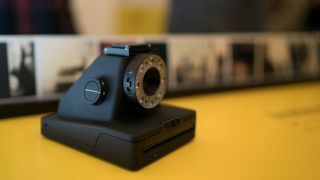 However, six years after reinventing instant film, the German company has now created its own instant camera. Meet the Impossible Project I-1. It bears a strikingly similar silhouette to the original Polaroid camera and it uses Type-600 film, but that's those are the only ways the two instant film cameras are alike. Impossible Project's CEO Oskar Smolokowski told me that the I-1 is an analog camera for the digital age. It does everything your (grand)parents' Polaroid camera did, only better and with the ability to connect to a smartphone. While you can frame your shots and take photos with the shutter button, there are no controls on the camera itself. Instead you have to turn on the app and pair it to a smartphone to adjust your shutter speed and aperture. The app also offers specialized shooting modes including double exposure and light painting among others. By itself, the camera operates on automatic mode at all times, adjusting the exposure and racking focus on its own. Though there's a viewfinder, there's no light or chirp to tell you whether your subject is in focus other than to keep it centered in the flip up optical viewfinder. There is a plus/minus switch, which essentially acts as your exposure compensation bringing the exposure up or down by a stop of light. Otherwise, you'll have to take out your smartphone to tweak your settings. It's an interesting shift that forces you to stay in the moment and focus more on what's in your shot rather than getting the exposure right. Once you hit the shutter, the camera spits out a photo and you'll wait for a few seconds (or longer if you're in a cold place) for it to develop. All there is to the camera is a lens with a built in 10 LED (eight white, one red, one blue) ring flash wrapped around it, plus a built in light meter and autofocus system. You won't find a single screen or even an indicator light on this camera. Instead, Impossible Project decided on a minimalistic design for the I-1 and made smart use of the ring flash to display battery life and your remaining shots. The ring flash lights up one LED at a time to inform you of the remaining battery life when you push the shutter button and the camera is off. Alternatively, you can pull the on switch – which is a rotating ring around the shutter button – back to find out how many pieces of film you have left. With each pack containing only eight pieces of film and going for $24 (£15) a pop. Every shot is precious and unpredictable, but that was the part of the charm of the original Polaroid camera and it lives on in the Impossible Project I-1. The instant film camera is on sale now for $299 (£219) or $349 (£269) with three packs of film, and you can buy it from directly through the Impossible Project, MoMA Design Store, colette, Paul Smith and Selfridges in the UK.